Seven kilometers north-west of Riga’s center, you’ll find the affluent garden suburb of Mežaparks. The name literally means “Forest Park”, giving you an idea of the abundance of trees and greenery there. Since the start of the 19th century, it’s become a fashionable place to live. Nowadays, this exclusive real estate is favored by bankers, lawyers, politicians and ambassadors. But you’ll find a lot or pleasure-seekers and tourists here too, especially the active types and those with children. The area of Mežaparks was first inhabited in the 17th century, when it was known as “The King’s Forest”. The Swedish king Gustav II Adolf, whose country had occupied Riga at the time, established a military camp there in 1621. 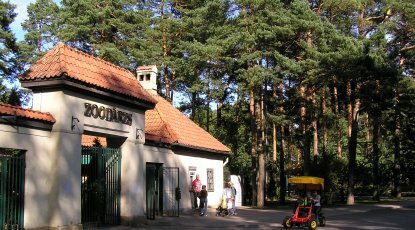 The Germanic name, Ķeizarmežs (Kaiserwald), meaning “The Emperor’s Forest”, was retained up until 1923 when it was officially changed to the Latvian name Mežaparks. (Incidentally, there is still a part of the suburb called Ķeizarmežs). Farmers lived and worked here up until the middle of the 19th century, growing produce for Riga’s inhabitants. The area was also a place for the city dwellers to relax in the countryside. At the end of the 1800s, the head engineer of the city, A. G. Āgtem, decided part of the area by the Ķīšezers Lake would be an ideal place for summer houses. Soon after, intense construction of these buildings began. The area was also well connected to the city by tram. Overall landscaping of the territory was designed by Riga Gardens director Georg Kuphaldt. The building boom resumed during Latvia’s first period of independence, when more than a hundred luxurious villas and flats sprang up all over Mežaparks. The landscape of this genteel garden city changed drastically after World War II. Privately owned villas were confiscated by the state during the Soviet era. Many of these were then divided so that several families lived in one dwelling. As a result, they were neglected for many years, explaining why many houses are still run down. However a lack of new buildings also preserved the unique forest attraction and historic atmosphere of this residential area. In 1988, the suburb was the meeting place of members of the Popular Front, a political group that proved instrumental in the restoration of Latvian independence. In 1990, the open air stage was where the incredibly emotional first Latvian Song Festival concert took place after reinstating national sovereignty. After Latvia regained independence, the process of returning the Mežaparks residences to their pre-war owners occurred during the 1990s. Many of these were renovated, and are still undergoing restoration. New development has also been attracted to the area, which sees continuing construction of expensive new residences too.